The main purpose of this chapter is to extend the literature on drivers and barriers to GSCM from a different cultural framework, namely Egypt. The chapter is structured as follows. First, the importance and the components of GSCM are discussed briefly. Next, the benefits of GSCM and the main pressures/drivers that force the business sector to migrate its traditional supply chain activities to be green are highlighted. Next, the key theme of this chapter, the barriers and challenges facing the global business sector for extending green supply chain practices are discussed. Then, the results of multiple interviews that were conducted in multinational Turkish and Egyptian companies operating in Egypt are revealed in order to explore the drivers, benefits and barriers of GSCM and to propose the strategies for overcoming the barriers toward green economy. Finally, the chapter concludes with discussion and recommendations. ‘Green’ is the new slogan in today’s business world. Global warming, increasing quantities of municipal solid waste, scarcity of natural resources, and many other factors impel regulatory and international bodies to take corrective and proactive actions towards the sustainability of the environment. The concept of sustainable development emerged to control these impending environmental, economic, and social crises (ElBarky & ElZarka, 2015). Businesses in return found themselves in the spotlight to make fundamental changes in their practices to fit into the ‘green’ era and achieve sustainable development objectives. 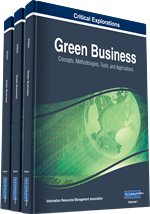 Many strategies, approaches, and standards have been proposed and implemented such as eco-design, green production, green logistics, and reverse logistics. All of these strategies contribute to green supply chain management. Consequently, Green Supply Chain Management (GSCM) emerged as a complement to Supply Chain Management (SCM), since many of its processes have a significant impact on the environment in the form of CO2 and other toxic emissions, solid waste, and effluent water (Sarkis, 2012). The concept of a ‘green supply chain’ was first proposed by the Manufacturing Research Consortium of Michigan State University in the U.S. in 1996 for comprehensively considering environmental impacts and resource optimization in manufacturing supply chains. There is no existing standard definition of GSCM. However, for the purposes of this chapter, the concept is defined as “Integrating environmental thinking into supply-chain management, including product design, material sourcing and selection, manufacturing processes, delivery of the final product to the consumers as well as end-of-life management of the product after its useful life” (Srivastava, 2007, p.54). Under the backdrop of globalization, supply chain involves partners across continents. Globalization of supply chain represents differences in economies, infrastructures, cultures, and politics in the competitive environment (Manuj & Mentzel, 2008). In other words, globalization puts added pressures on techniques and practices of SCM. Besides, international trade drives sustainable supply chains. A sustainable supply chain requires proactive relationship management, including organizational learning, transfer of knowledge and capabilities from the large players in the supply chain, as well as development of an appropriate organizational culture and trust (Ki & Rowlinson, 2011). On the other hand, GSCM helps businesses to reduce operating costs, enhance productivity, enhance business reputation and reduce the risk of being prosecuted for anti-environmental and unethical practices. Considering GSCM’s expanded positive long term impacts on organizations, international trade promotes the transnational spread of green supply chains, and it is recognized as an effective mechanism to address environmental issues alongside the global supply chain. Despite ample evidence of the benefits of GSCM, bigger portions of organizations in different industries are reluctant to adopt GSCM or fail to implement such advanced systems because of internal and external environmental barriers. Considering this, the main aim of this chapter is to explore the primary barriers to implementing GSCM in the international business sector. Although there exists a well-defined body of evidence on barriers and their consequences on GSCM operations in various countries, research on GSCM in Egypt is rather limited. Therefore, one of the purposes of this study is to extend the literature on drivers and barriers of GSCM from a different cultural framework, namely Egypt. Interviews with companies operating in the same country with different countries of origin (Turkish and Egyptian) were used to arrive at a better understanding of drivers and barriers to implementing GSCM in Egypt.